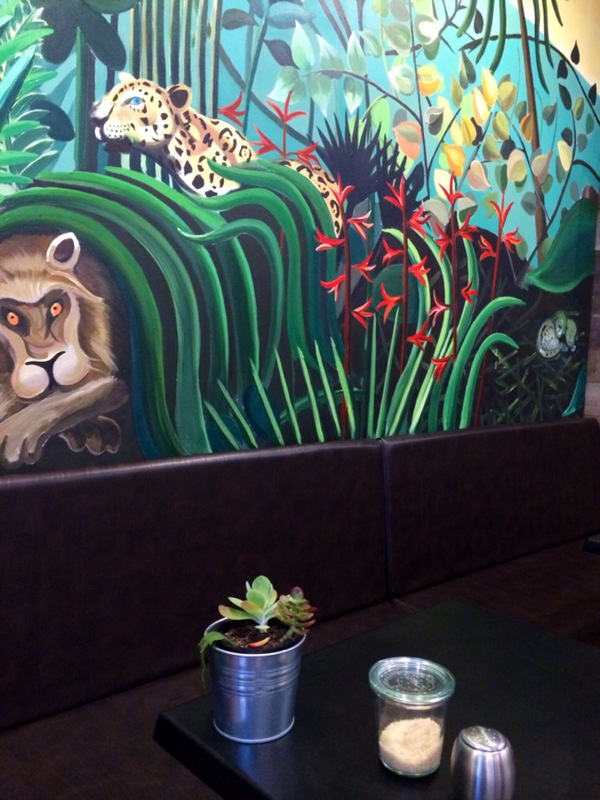 Stepping into Subiaco’s new breakfast spot The Lion & Jaguar is like stepping into an African safari. The new addition to the suburb is nestled in the arcade near the train station, and even though I don’t visit Subiaco too often I couldn’t miss the fluffy animal print stools spilling onto the street from the small, but festive cafe. It’s a funny story really on how my friend V and I choose our brunch spots. We like to take turns providing each other with three options and then the decision is made – so we both win! It was my turn to find us a few choices and since viewing some great foodie snaps of Lion’s brunch menu on Instagram I was very happy when he came back with this choice. 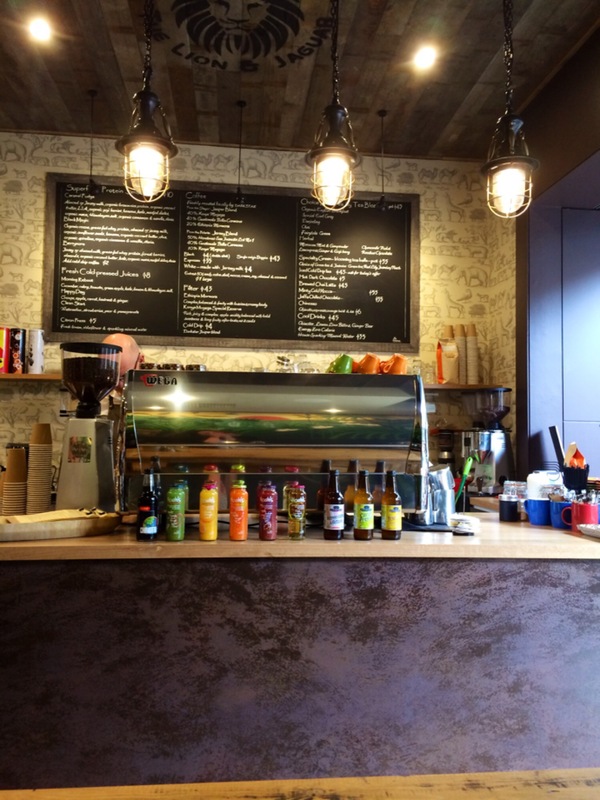 As well as the brilliant leopard print fluffy stool coverings, the cafe features an amazing Jungle Book-esque style mural covering the entire wall which made for some wonderful photo opportunities. Keeping with the nature theme, potted plants were very much at home nestled amongst the salt and pepper shakers on the tables. V and I sat inside at the wall long booth right near the mural of course! One of the main reasons I wanted to try The Lion and Jaguar was the menu. It’s not your typical selection of breakfast dishes. Pack your passport when ordering, because there are so many “international” options to choose from. 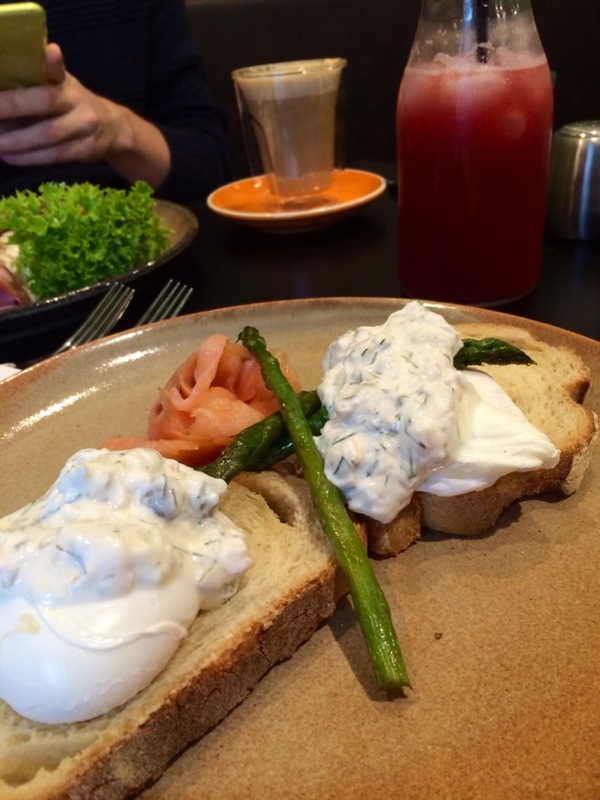 I was feeling very Swedish on this particular morning so I went with the Southern Sea ($16.90) – wood smoked salmon, poached eggs, grilled asparagus and dill remoulade on rye sourdough. Food presentation was on point. The asparagus was crunchy and fresh, adding texture to a predominantly soft dish. The eggs were poached to perfection leaving me happy from first fork stab. Much goo. The smoked salmon was also very fresh and tasty as it should it be! What made the dish though was the dill remoulade. I’ve never tried anything like it. If you’re not a dill fan perhaps this isn’t the breakfast choice for you but I was very impressed by the accompaniment. V passport was stamped in Russia while I enjoyed my Swedish morning. 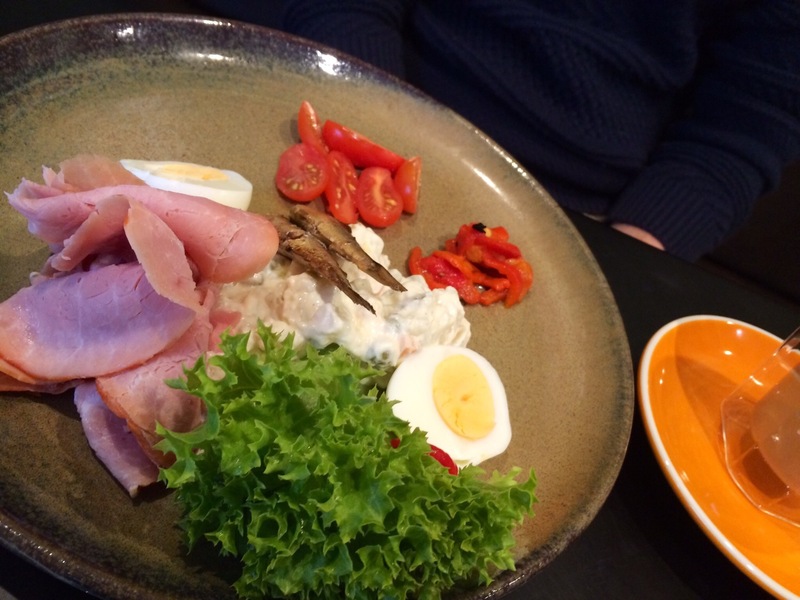 He opted for the Russian Egg ($14.90), a tasting plate of sorts featuring a hard boiled egg, Czech potato salad, black forrest ham, smoked Riga sprats, pickle, capsicum and tomato. So much food! While he enjoyed the dish he felt as if a lot was going on and it may have been more suited to a lunch time dish. If you’re not a Swedish or Russian foodie they also offer more standard options. 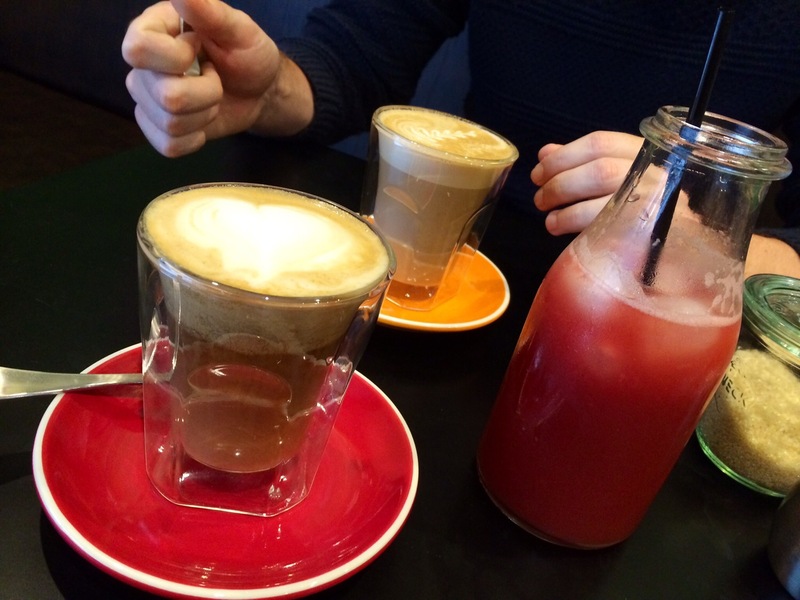 Being greedy, I ordered my usual Soy Long Macchiato as well as a Clean Start Juice ($8). 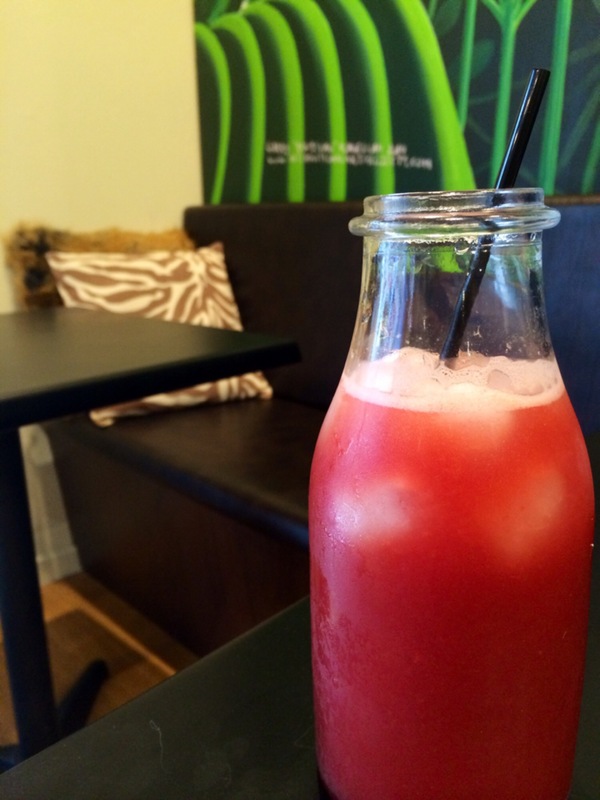 The juice was watermelon based but also included pear, strawberries and pomegranate. It was sweet, zingy and refreshing. The coffee was pretty standard, not too strong and certainly not bitter, but it was served a little cooler than I like it. Disappointment. But one average coffee won’t put me off! 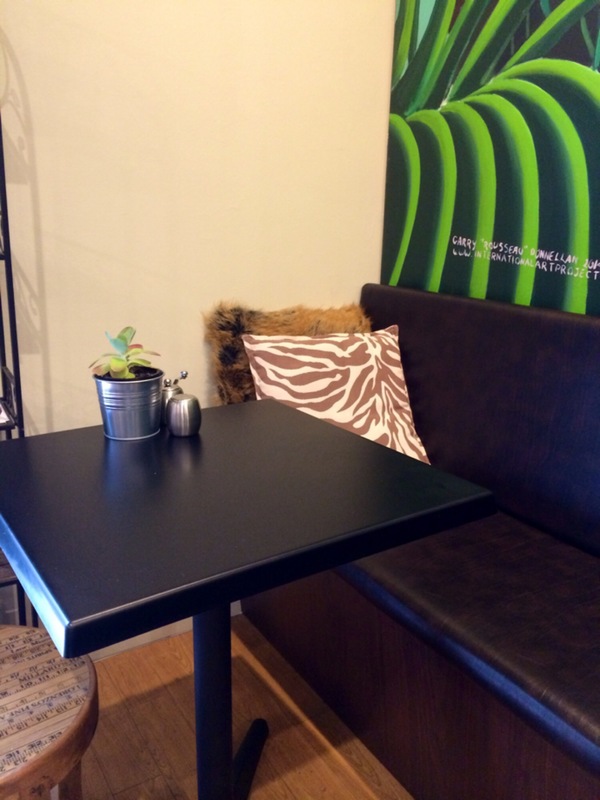 The staff were very friendly stopping by for a chit chat as they cleared our table and we felt very much at home. If you’re looking for somewhere shiny and new with a different kind of menu you’ll really like this spot! Who doesn’t like dining in the jungle? Are you a traditional breakfast fan or would you be willing to try something a little different? Looks like a great place to try. Clever having different countries foods represented – something for everyone !! I know right! It is certainly a fun foodie experience!